In Fourier transform infrared spectroscopy (or FTIR analysis), an infrared spectrum of a sample is made by passing a beam of infrared light through a sample or reflecting off of the surface of the sample. The infrared light is absorbed at specific frequencies representing the vibrations of bonds or groups in the molecule. For a vibrational mode in a molecule to be infrared active it must have a permanent dipole. An absorbance spectrum is produced, showing the wavelengths that the sample absorbs, revealing details about the molecular structure of a sample. Optical image (top right), 2D contour plot (top left) and FTIR spectra (bottom) of an ink spot on a business card. 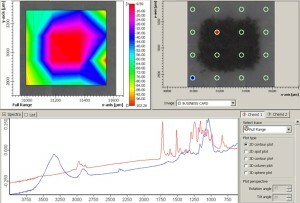 These results show the mapping capabilities of the Hyperion 2000. 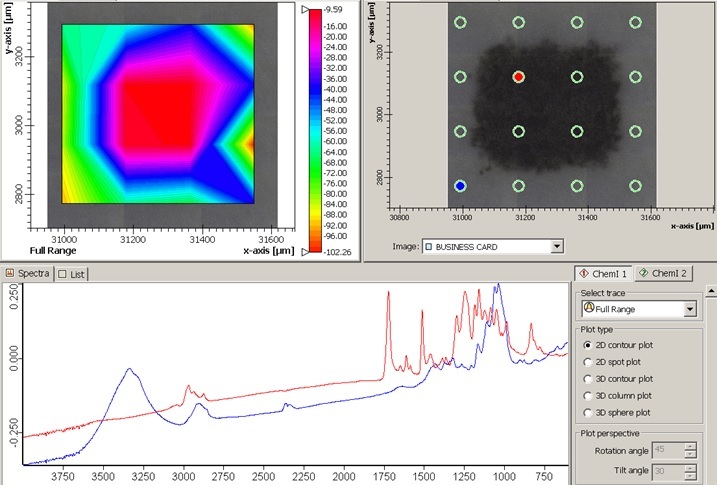 The FTIR spectra are from the blue and red areas highlighted on the optical image. FTIR spectroscopy is particularly useful in analyzing and identifying organic and some inorganic compounds. Searchable in-house, electronic and on-line spectral databases are commonly utilized and are invaluable in identifying industrial chemicals and products. Samples can be as small as 20µm and the FTIR spectrometer is sensitive to components that are present in concentrations greater than approximately 3-5% of the total.